Information Systems - CIS 4372 HCI and Data Viz. Information Systems is the interaction between people, processes and technology. I.S. is about technology and how an organization and people interact with the technology and how the technology works with the business processes. Information systems are systems that use information technology to capture, transmit, store, retrieve, manipulate, or display information. When I think about the field that we are in, I can't help but feel frustrated when someone asks me what it is that I do. I have trouble answering that question in a way that someone like an accounting major or a marketing major might answer it. It isn't as simple as " 'What do you do for a living? ', 'Well I'm an education major', 'Oh so you'll be a teacher' ". When someone asks me what I do and I say Computer Information Systems, people usually say, "Oh, well that sounds interesting. Lots of good jobs in the computer field." Anyway, when I think of what I do, what it is that every class I've taken has required, it's been to solve someone's problems using computers, software, and related technology. Can anyone help to condense or redefine that definition of I.S. I see information systems, as we discussed before in class, as the bridge between Computer Science and an organization. CS is the bare bones of computer programming; this is where programming languages, operating systems, and even integrated development environments are developed. These tools and programs are then used by both CS and IS programmers to develop various applications. I believe that CS focuses more on the theoretical side of computing by attempting to make processes and the overall computer run faster by creating new algorithms and refining old ones. IS, on the other hand, focuses more on the applied side of computing by using the available tools to develop and implement systems that will benefit the consumer. Overall, I believe that individuals in IS use what has been developed by programmers in CS to develop applications and systems that will benefit and satisfy organizations/consumers. I agree with several of the points that were made during class in the discussion. When looking at the three technical fields as IT CS and CIS I think it is very simple to define which is which. IT is very repair oriented as such these degree plans are incredibly certification focused. CS on the other hand is very much the root of everything being insanely technical. CIS on the other hand is adaptable, it is the field that works with computers to assist the ease of use with all users. CS makes computers, IT repairs computers, and CIS does everything else. I believe that IS covers a wide spectrum of technology. It covers everything from networking and programming. I believe it also includes a business side, dealing with management. Management within an organization attempts to carry out the organizational mission through the use of technology and IS exists at the core of this process. Technology represents the administration provided by IT and the development provided by CS, the organization is symbolized by its mission, goals, and strategies while the management signifies both project and personnel management. IS bridges the gaps between all three. As an IS trained professional you are qualified as a team leader or manager that facilitates the development and administration of the systems or applications that will be used by management to fulfill the goals of the organization. You have to be familiar with several different and often conflicting aspects of the organization whether it is application development, administration (servers, network, and security), project management, or general management. In the illustration of the 2 circles that intersect, the gray area in the middle is what I perceive as IS. When someone asks me what IS actually is, I myself am lost for words when trying to describe it. There is so much that goes into what IS is and what people in an IS career do. I think that at it's most basic level, IS is the collaboration of information, people, and technology and creating a process that brings all that together into something meaningful to a business or group. The next phase, would probably be securing that information, and being able to present it as meaningful information. Information systems, as a discipline, focuses on exploring the interface between management, information science and computer science. Computer Science focuses on information technology: software. 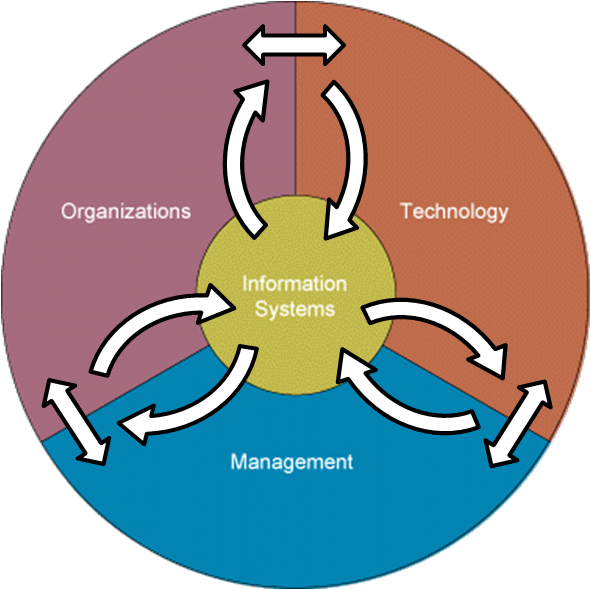 Information Systems mediates the two opposing worlds of human activity systems and information technology. This definition is essentially a synopsis of the way we described it in class, which is the one that makes the most sense to me. Honestly until you assigned us this question, I, like many others, didn't really know exactly what IS was. But now I can say with confidence that IS managing the relationships between users and computer systems. This of course requires knowledge of both sides of the equation. 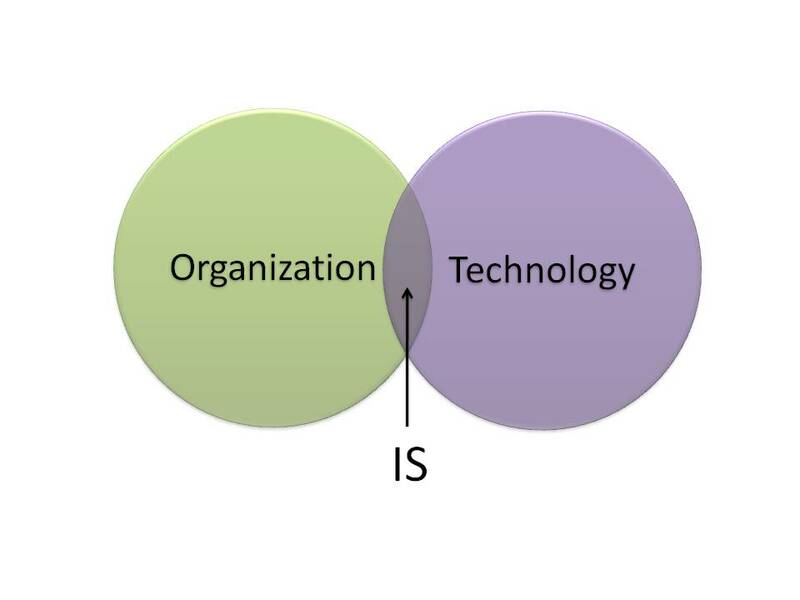 IS is simply information systems. With computers in the mix you have systems of collecting information that is transmitting with the aid of computers. A system is a network of processes. Information is data that is gathered to give you insight into what your system is doing. The system that you are gathering information about is different from the system that is providing you the information. It is hard for me to envision IS as it is today without thinking about a network and the data that the network transmits. Maybe it is better to state how IS is possible. In my field, electrical engineering, there is equipment. This equipment has evolved over the years to be capable of storing data. Not only can it store data but it can communicate with other equipment that transmits and receives data. Now if you are going to transmit and receive the data, you have to have something to interpret the data. Once you are able to interpret and store the data at a centralized station you can further manipulate the data that you have gathered to help you solve any problems that you may have as long as it is associated with the data. To get to this point of problems solving, somewhere down the line, somebody has to develop the tools of gathering, storing, and communicating the data. So far, I have mostly dealt with more of the end user part of this system. As you learn more, you should be more capable of designing the individual parts of the system such as the database, software, and communication applications. The Information System consists of six parts which include: people, procedures, software, hardware, information and data. There are various types of information systems, for example: transaction processing systems, office systems, decision support systems, knowledge management systems, database management systems, and office information systems. Critical to most information systems are information technologies, which are typically designed to enable humans to perform tasks for which the human brain is not well suited, such as: handling large amounts of information, performing complex calculations, and controlling many simultaneous processes. Basically, Information Systems make it easier for humans to operate in any type of organization, whether it be a technology based organization or just a collaboration of information. Within these systems, as shown above, organizations, management, and technology interact with eachother through people, procedures, software, hardware, information and data. Information Systems are very important and now I have a better grasp of how to explain this area.